Last Saturday Chaos Boy had two parties. The first one was at Adventureland just off Sardinia Bay Road at a venue where I haven't been to before. 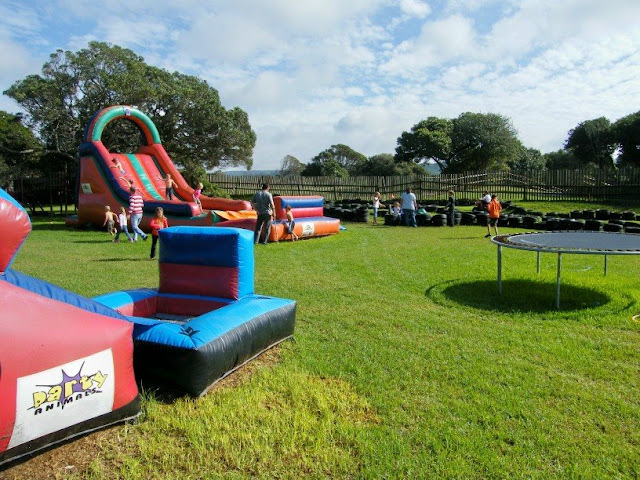 Its a very lekker spot with two jumping castles, two jumping castle slides (with water), quad bikes, trampoline, jungle gym, cable slide and all kinds of exciting activities. A real boys' party venue. 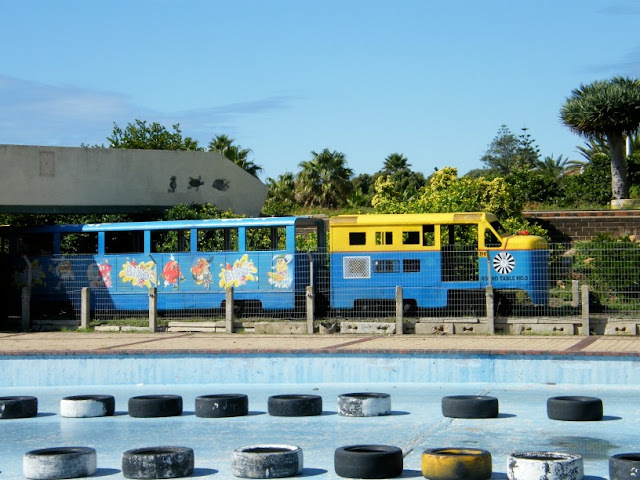 Is there anybody out there who grew up in Port Elizabeth who doesn't remember the Smartie train at Kings Beach? I remember how we went to the little kiddies pool by the train and went on rides afterwards. I still have a photo somewhere with us kids standing in front of the train. Today the pool is a quad bike / go-cart track, but the train still goes, although not called the Smartie Train anymore. The Bibo Train runs on Sundays and also cater for school groups and birthday parties. Although there are many 5 star game lodges around Port Elizabeth and lots of 5 star boutique hotels and guesthouses in town, we haven't got a proper 5 star hotel in the city... But that is about to change. 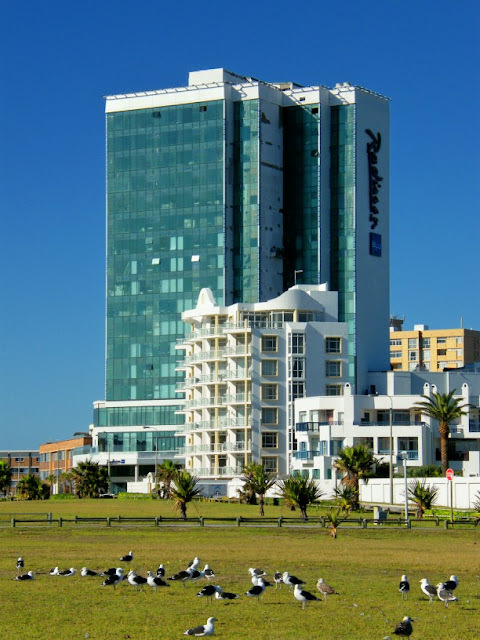 The new 5 star Radisson Blu hotel on the main beachfront in Summerstrand is about to open in the next couple of weeks. The hotel will have 173 rooms and will truly give a new dimension to visitor accommodation in the city. For more information on the hotel, have a look here. The view towards the Edward Hotel (left) and Grey Institute (right) from the top of the Donkin Lighthouse. My favorite art gallery in Port Elizabeth is the Ron Belling Art Gallery on Park Drive close to St Georges Park. I recently also did a post about it on The Firefly Photo Files. 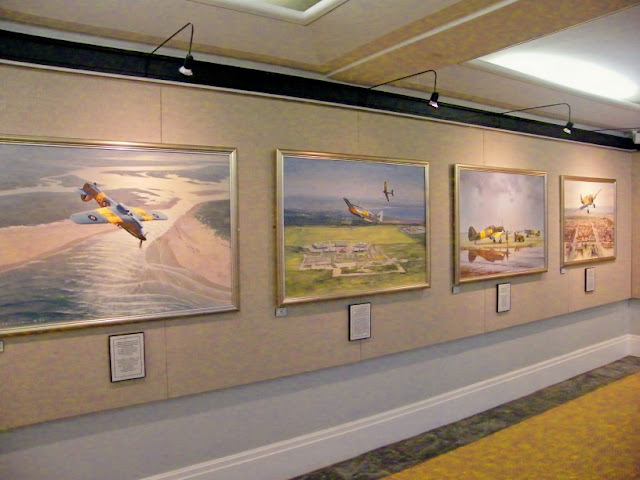 Ron Belling (1933 - 1998) was a Port Elizabeth architect, aviation and marine painter, and an authority on aviation history, aircraft design, aircraft camouflage and markings. The most amazing fact about him was that he was a self taught painter who could do the most amazing things with a paint brush. 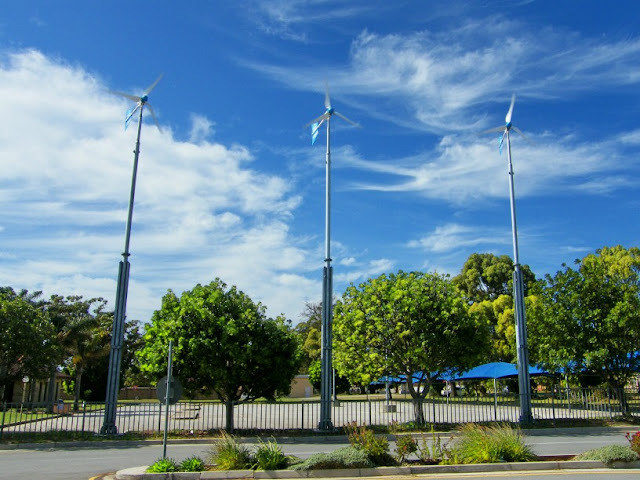 The Pick n Pay head office next to Walmer Park Shopping Centre recently launched a new phase in its effort to achieve energy independence. It erected a small "wind farm". The stars of the show is three 12-metre e300 Kestrel turbines built at Eveready's Port Elizabeth factory. Many people like to take a leisurely stroll along the beachfront to relax and enjoy the view. On a nice evening you will probably see quite a few people walking around the Boardwalk and Hobie Beach. This view is looking back across Hobie Beach from Shark Rock Pier. 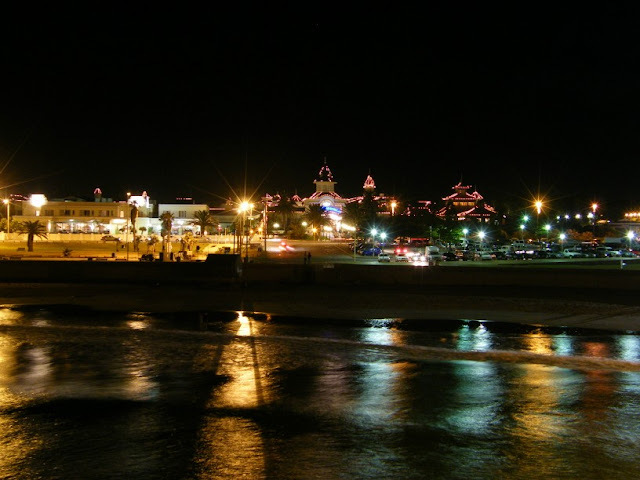 The building on the left is the Beach Hotel , while the lights in the middle belongs to the Boardwalk Casino and Entertainment Complex. Today is South Africa's 4th democratic national elections. 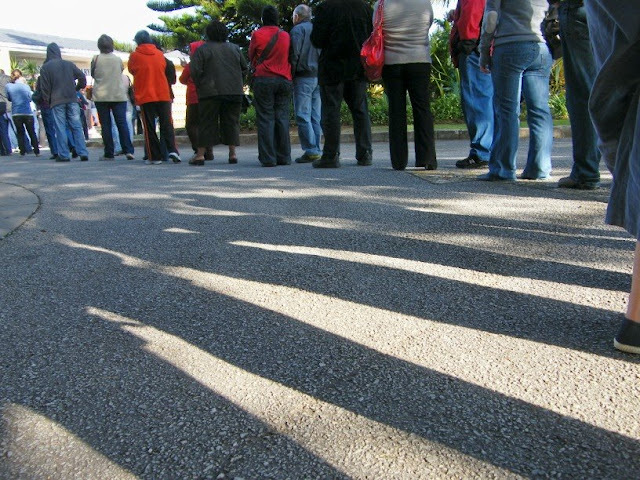 The polls opened at 07h00 and will be open untill 21h00 tonight. Because of the elections it is a national holiday to enable everybody to go and vote. Bartolomeu Dias (Bartholomew Diaz) was the first European according to history to set foot in South Africa. In 1488 he rounded the Cape unbeknown to himself in a storm and first set foot in Mossel Bay. 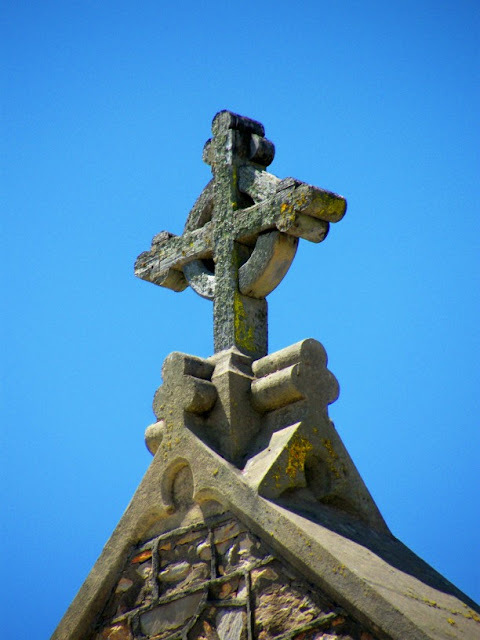 From there he sailed down the coast and landed in Algoa Bay where he planed a stone cross on St Croix island. He sailed further up to Kwaaihoek near present day Kenton on Sea where he planted a cross and turned around to Portugal. 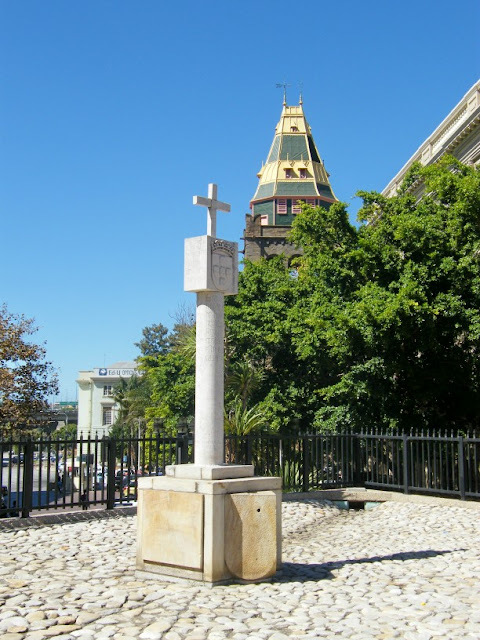 On Market Square is a replica of the crosses that Diaz planted which was donated to the city by the Portuguese government. The other significance to posting a cross is that tomorrow we have national elections and everybody will be going to the polling stations to make their cross. 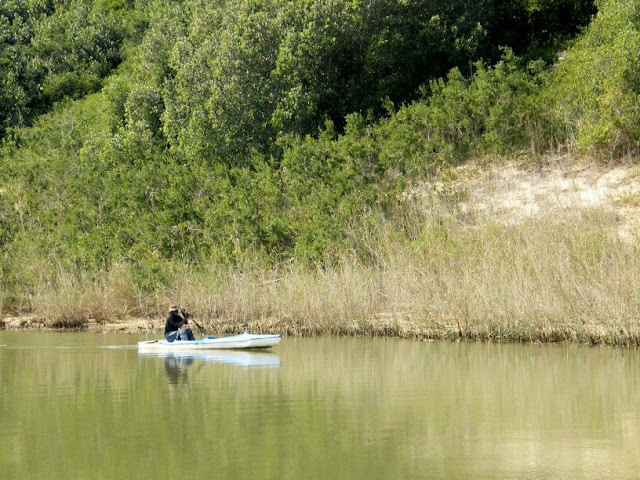 Kragga Kamma Game Park is situated on the outskirts of Port Elizabeth and is the ideal spot to go and view lots of wild game close to the city if you haven't got enough time to head out to Addo Elephant National Park or one of the bigger game reserve. The reserve has white rhino, buffalo, giraffe, zebra and loads of different antelope. 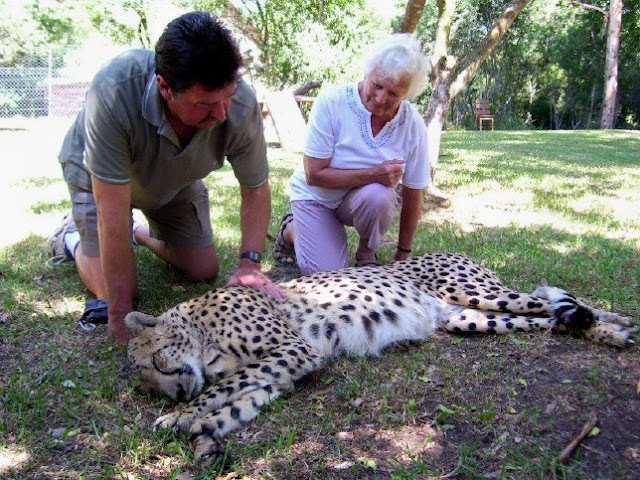 One of the highlights of the visit to Kragga Kamma is the opportunity that visitors has to interact with Duma the tame cheetah. Duma is a movie star and was one of several cheetah cubs that was used in the making of the the movie Duma. 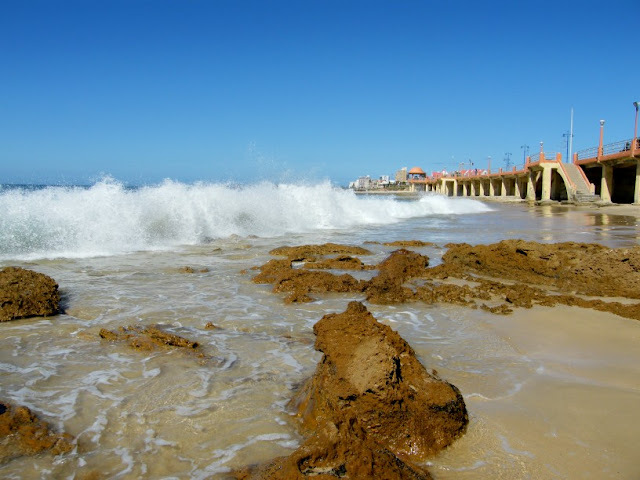 Visitors to Port Elizabeth's beachfront will more than likely take a walk along the beachfront promenade between Kings Beach and Hobie Beach past Humewood Beach and Happy Valley. The other day walking along there I decided to climb down the steps to the small strip of beach and got this photo looking towards Hobie Beach side. The promenade is visible on the left. 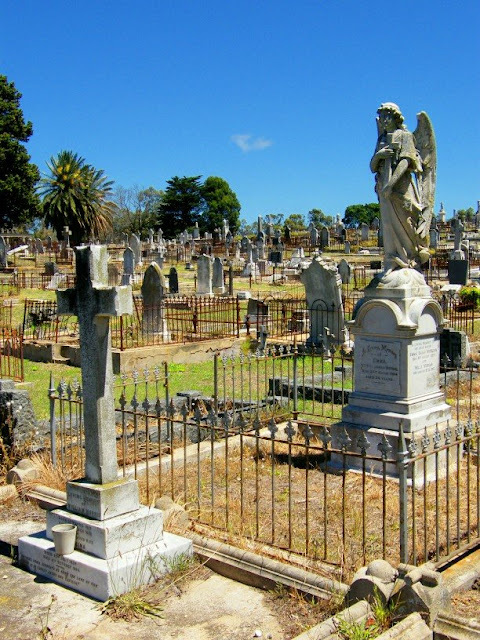 I find cemeteries to be very fascinating places. There are always interesting things to be found in the grave stones, monuments, inscriptions on the headstones or just the age of the graves. South End Cemetery is just around the corner from the office where I work and I have stopped by there many lunch times to see if I can find something new (or old). Bethelsdorp Village was established in 1803 by Dr Johannes Theodorus Van Der Kemp, a missionary working among the Khoikhoi. Many of the old buildings in Bethelsdorp Village are protected by the National Monuments Act. 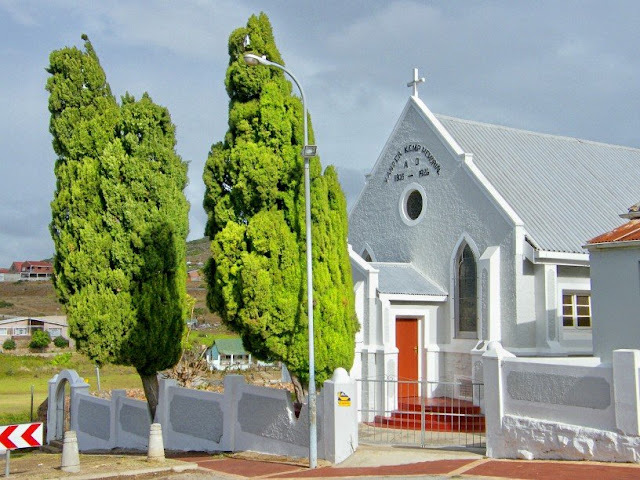 The Van Der Kemps Memorial Church in the village was first built in 1803 and is generally regarded as the first Congregational church in southern Africa. It was destroyed by fire in 1890, rebuilt in 1903 and again in 1926 and extended in 1985. Behind the church is the so-called Livingston Cottage, used by visitors to the village. According to the legend, Dr David Livingstone also stayed there. In front of the church is the Market Square with the Mission Bell, erected in 1815 and in the street next to it visitors will see the Almshouse built in 1822 to accommodate the destitute. Part of the ruins of St Peter's Church in South End. 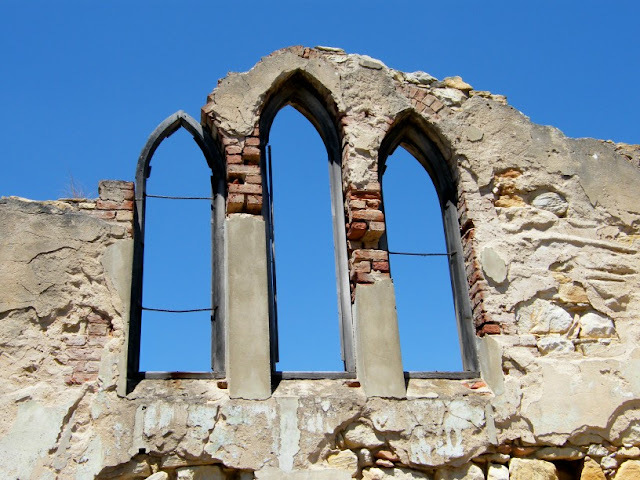 Built in 1877, the church was partly demolished by the apartheid government to prevent members of the congregation to return after the community was forcibly removed in 1965. For more info and pictures, visit The Firefly Photo Files. Why not pop over to Skywatch to see some more photos from all over the world. 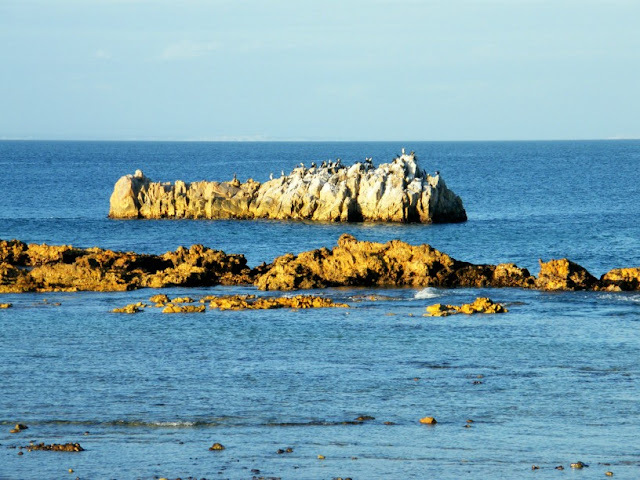 Bird Rock is situated between Hobie Beach and Pollock Beach about 100 meters from the beach (depending on the tide of cause). It is called Bird Rock because there are always a couple of marine birds sitting on it and you can actually see the colouration of the rock with all the bird dung on it. On our way back yesterday from our weekend in Cape St Francis I decided to see if the Van Stadens Pass is open for traffic since the road has been fixed. What a delight it was to see that after several years of being closed to traffic the pass was open again. Driving down the vegetation changes from fynbos and bush to indigenous forest. Stopping at the old bridge at the bottom, one can get out and look up at the arch bridge which was opened in 1971. What a view. I even saw two Knysna Loeries fly across the road at the bottom. 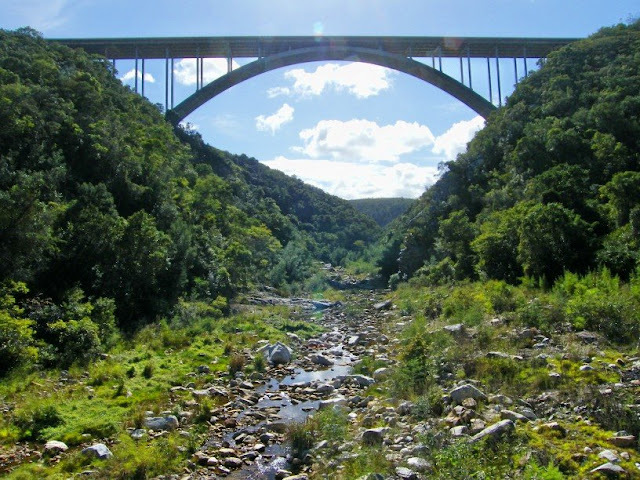 The unfortunate part of the Van Stadens Bridge is that it is also known as the suicide bridge or bridge of death. Over 70 people have jumped off the bridge since opening, the last one just last week. 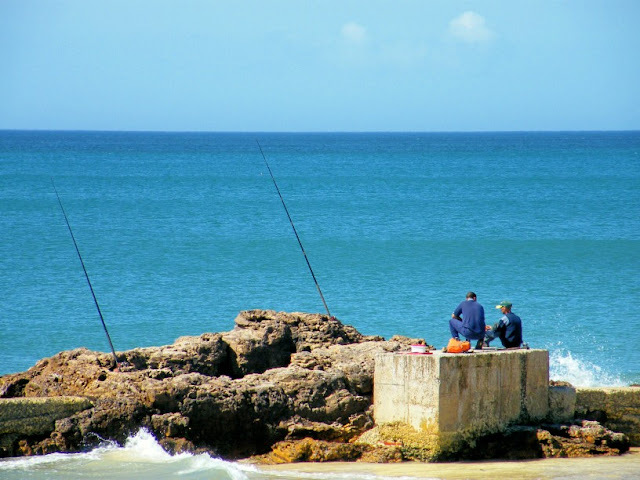 A couple of recreational fishermen fishing off the rocks at Humewood Beach. In South Africa you need a fishing license to fish in the ocean or any public (anything not in private ownership) fresh water dams and rivers. A license can be obtained from the Port Office at a nominal fee. A local fisherman paddling up the calm Sundays River at Colchester. It is funny how many people think the river is named for the fact that a lot of people go out to Sundays River over weekends and specially on Sundays to go and enjoy the river and its environs. The name actually comes from the Zondagh family that farmed higher up in the river in the 1800's. 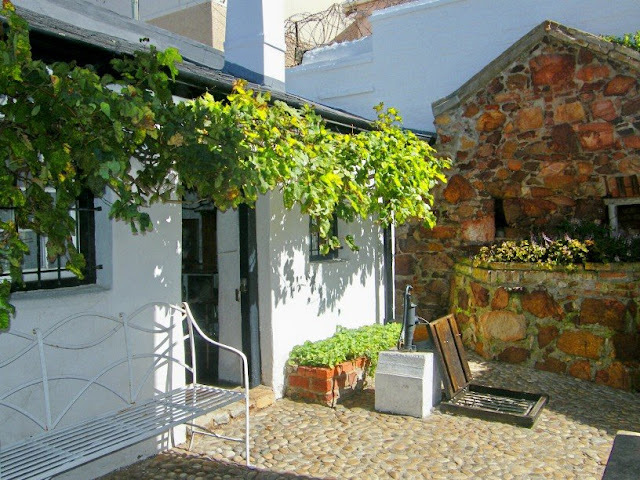 No 7 Castle Hill must be the most beautifully preserved historical house in Port Elizabeth and was built in 1830 by the Rev Francis McCleland who was the first Colonial Chaplain in the city. Today it is an historical museum furnished in the style of the mid-Victorian era. The original charming cobblestone in the backyard was retained and the hand pumped well was restored and is in running order. One of the stone crosses on top of The Hill Presbyterian Church in Central. Happy Easter. This 450 hectare Van Stadens Wildflower Reserve lies 40 km west of Port Elizabeth on the N2 to Cape Town. It is the best place near PE to see lowland fynbos with flowering Proteas and associated fynbos endemics. 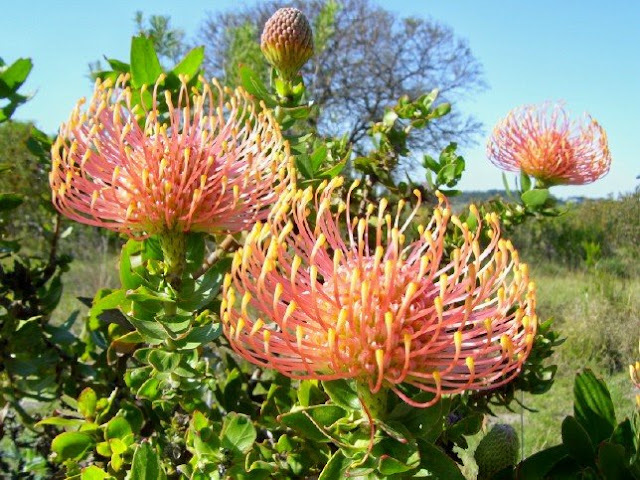 I used to stop there quite often in my tourist guiding days and there is always some kind of protea in bloom. In this case there were lots of pin cushion proteas in flower on this specific day I was there. The reserve is a bird watchers heaven with various walking trails covering the plateau and forested ravine. 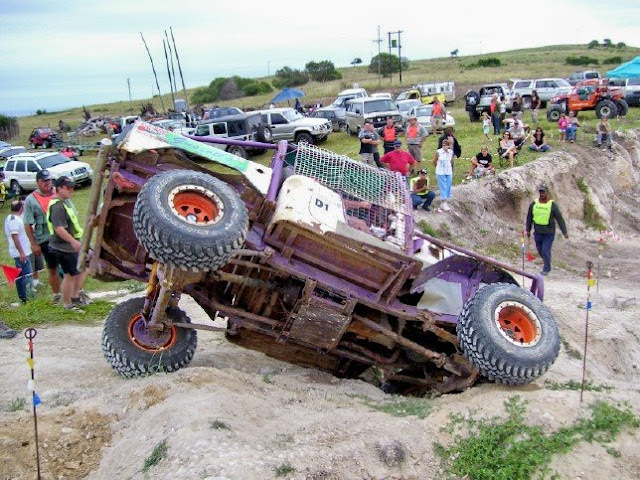 One of the competitors in a 4x4 challenge at Bishpig Adventure Camp off Kragga Kamma Road misjudging the distance to the hole and tipping over. Driver Jeff and co-driver Winneray was ok and went on to complete the rest of the challenges without further mishaps. In Port Elizabeth, a small reading society, known as the Port Elizabeth News Society was established in 1844 and housed in a rented room above a shop in Jetty Street. The reading matter consisted mainly of English magazines and London newspapers and the main South African newspapers published at the time, in addition to a small collection of books. In 1845, the Society moved to a rented room in the Commercial Hall which stood on the site of the present Main Library building. At a public meeting held on 26 July 1848, the residents decided to start a subscription library. £585 was collected from public subscriptions, and a yearly income of £197 was guaranteed. In addition, the government of the day gave a grant of £200. The Public Library was very successful and, partly through buying shares, but mostly through members who donated their shares, managed to acquire the Commercial Hall wholly as their own building. In 1854, the library moved out and rented the building to the Government, which used the old Commercial Hall as a court house. The library was housed at various sites until 31 July 1902, when it was officially opened and housed in its present building. In the 1960’s, plans were mooted to demolish the building in order to make way for the erection of a Provincial Administration block, which would include space for a Provincial Library Service. Fortunately, this never happened, and in 1983, the building was declared a historic monument. 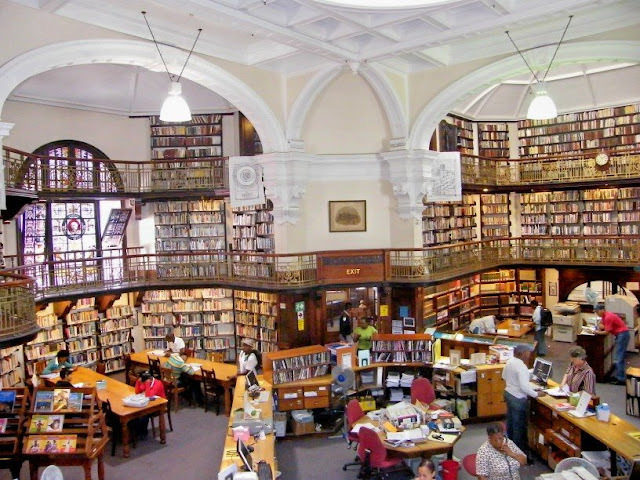 Today it is the only historic building in South Africa built as a Public Library which is still functioning as a public library. I love visiting the library. It just has a different feel to it with its galleries and stained glass windows. The one section at the Boardwalk Casino and Entertainment Complex is a wonderland of excitement for kids. 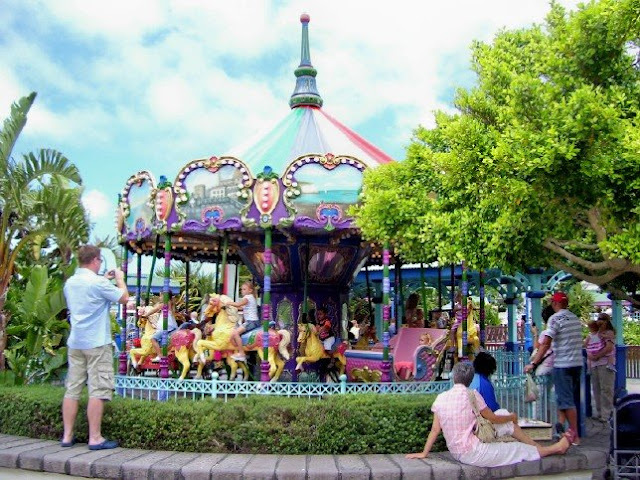 The have everything from a game centre to adventure golf and bumper boats, not to forget the good ol' Merry Go Round. Today was one of the flagship events on Port Elizabeth's annual events calender and one of the most grueling races in endurance sports in the world. 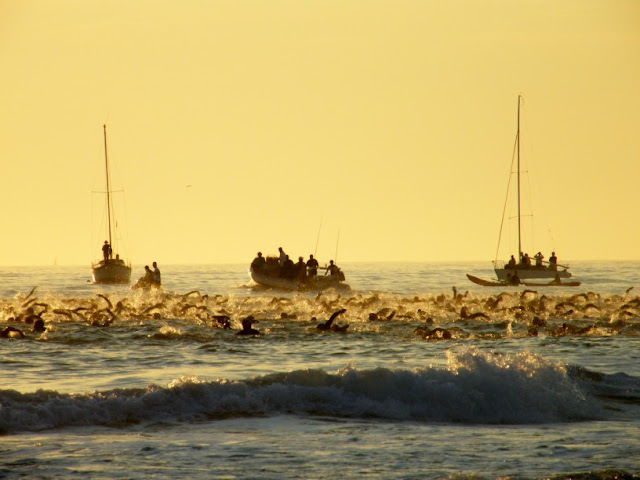 Ironman South Africa is hosted in Port Elizabeth annually and is the only Ironman on the African continent. The competition starts with a 3.8 km swim followed by a 180 km cycle. If that wasn't enough, it is ended off with a 42.2 km run. All in one day. For a couple more pictures on Ironman, visit my photo blog at The Firefly Photo Files. For more information as well as the history of Ironman, visit Wikipedia. A couple of years ago the (not so) Grand Hotel in Central started to encourage small businesses to rent space on Whites Road to trade from what I think used to be garages. Not many took them up on the offer. 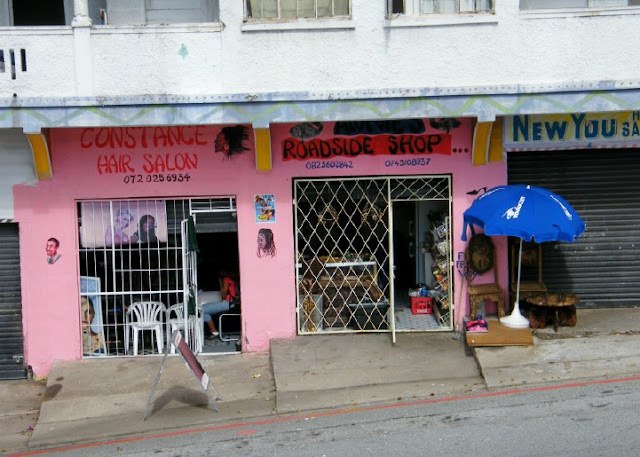 Some of those who did painted the outside of their shops pink to try and attract the clientele. In this case pink doesn't mean "Pink". So if you need a hair cut, give Constance a call. 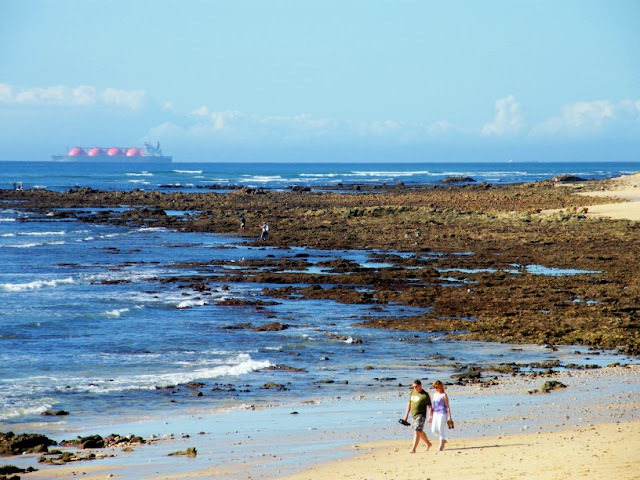 The town of Despatch, just outside of Port Elizabeth and part of Nelson Mandela Bay, had its origins in the brick making industry. Most of the bricks used in the construction of buildings around Port Elizabeth was made in Despatch. 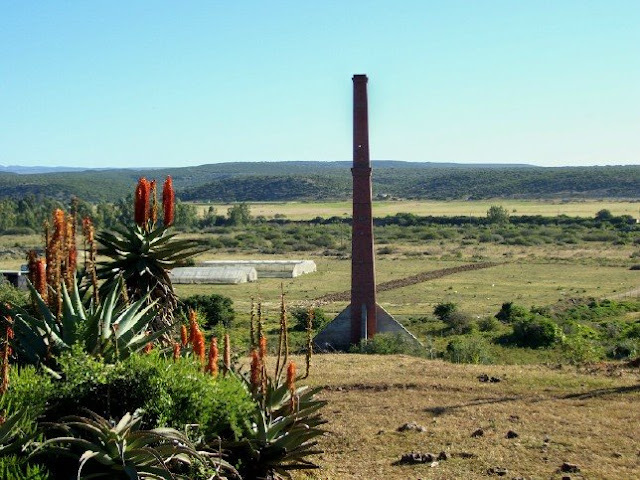 The railway line from Uitenhage to PE ran past Despatch and a sideline led to the brick works. It was from here here that the bricks got dispatched to PE by train, hence the name of the town, Despatch. On the outskirts of town standing next to the railway track, visitors to the town will find a brick chimney which was built in 1882 and formed part of those early brick works. A very extensive restoration project on the chimney has just been completed. 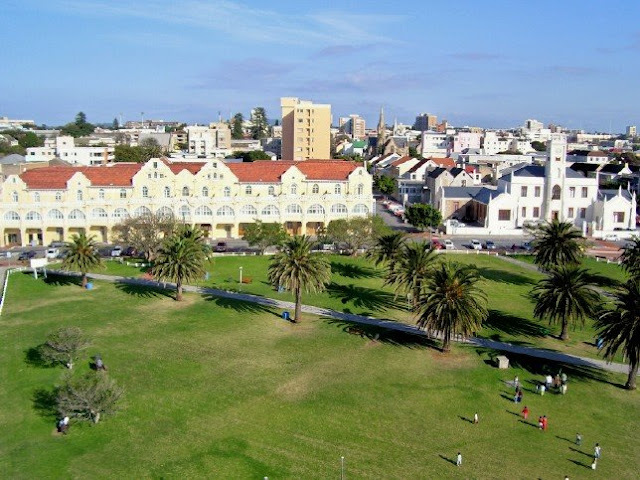 Port Elizabeth is one of the host cities for the FIFA 2010 Soccer World Cup to take place in South Africa. 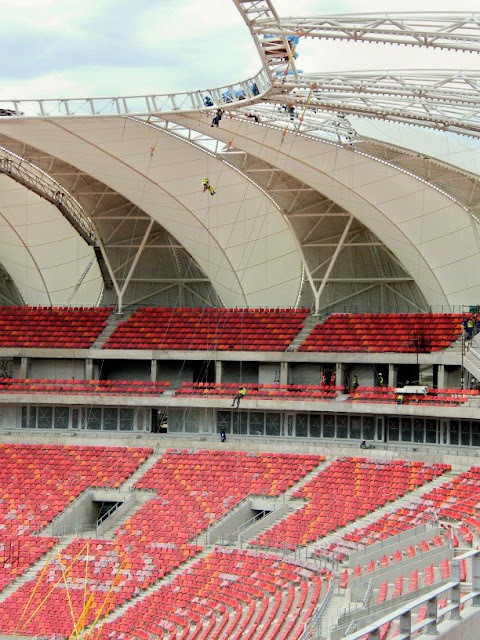 The new muti purpose 46 500 seater Nelson Mandela Bay Stadium is now nearing completion and its become more and more clear that it will be something the city is going to be very proud of. Here the workers putting on the cladding on the roof is busy absailing down as the wind was reaching the maximum speed that is safe for them to be up there. The first big game to be played at the stadium will take place on 16 June and will ironically be a rugby game and not a soccer game. It will take place between the touring British and Irish Lions and a Eastern Cape Coastal Invitation Team. For more great Skywatch pictures by some of the best blogging photographers in the world can be found here. 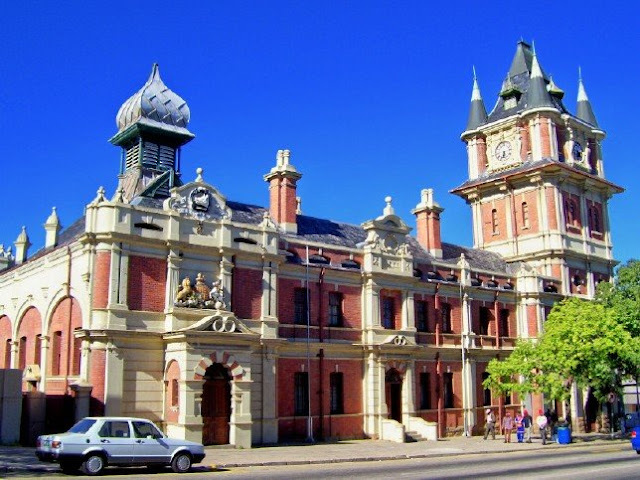 The Victoria Tower in Caledon Street in Uitenhage was built as Public Building between 1896 and 1898. It was named after Queen Victoria who was the ruling monarch at that stage and used to house the law courts.